“Twelve years,” was the reply. “And how long have you been gone?” the young man asked. “Two whole days,” the man replied. Guys, I don’t know what to tell you about Pee-tah’s tooth. I asked him for the story and he’s being all coy now about sharing it. I’m guessing we are going to have to give something up in order for him to share so give it your best shot. Offer him something and see if he comes up off of it. I’m making him a chicken salad. What are you offering? Oh, man, I got a little thrill just from typing that. Daddy-O and JiJi visited me for the Labor Day weekend, and it should be no surprise to you that I requested my father labor in the kitchen over my wok until this dish was done. I have no shame. I’m not even embarrassed to tell you that, it’s so good. Reading that list you can kind of tell that this is more of a method than a recipe, right? 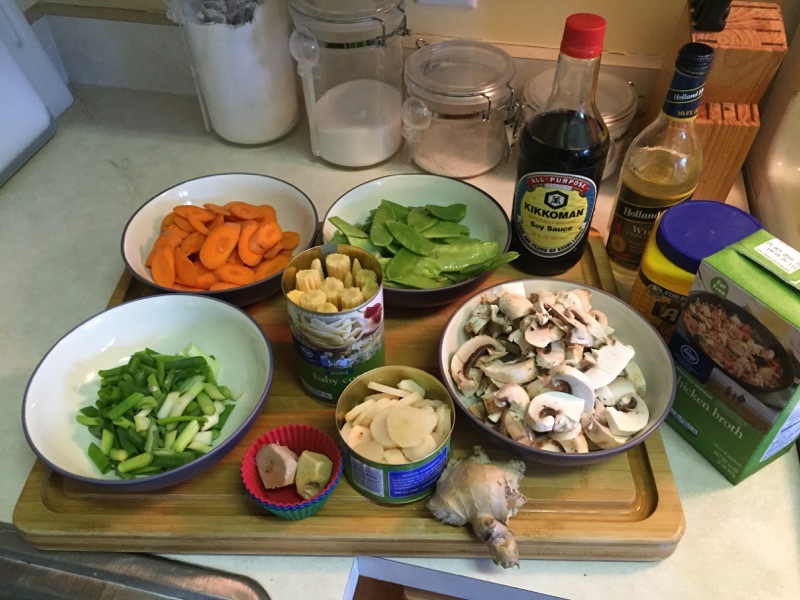 I just picked those ingredients because they are what I like and this blog is all about me, so me me me. My recipe. My favorite. My ingredient list in the quantities that I like. Me. Now, at this point I am required by all foodie blog laws to give you proper cooking instructions but again, I’m going about this differently. Because this is about my favorite food, I want to tell you how *I* cook it. First, about five years before I make this, I ask Daddy-O for a wok for Christmas. This is an important step because not everyone has a wok lying around. Then, about four years before I make this, I ask for a rice cooker for Christmas. This step is not as important but it works for me because one of my friends has one and I am jealous. Next I asked Daddy-O to sharpen my knives over Thanksgiving. This requires some planning as I have to pack them in my suitcase to drive them down to Florida but it is successful in that I get sharpened knives AND a knife sharpener because driving my three dull knives to Florida every time I need them sharpened is ridiculous. It is at this point we can begin the proper cooking process. 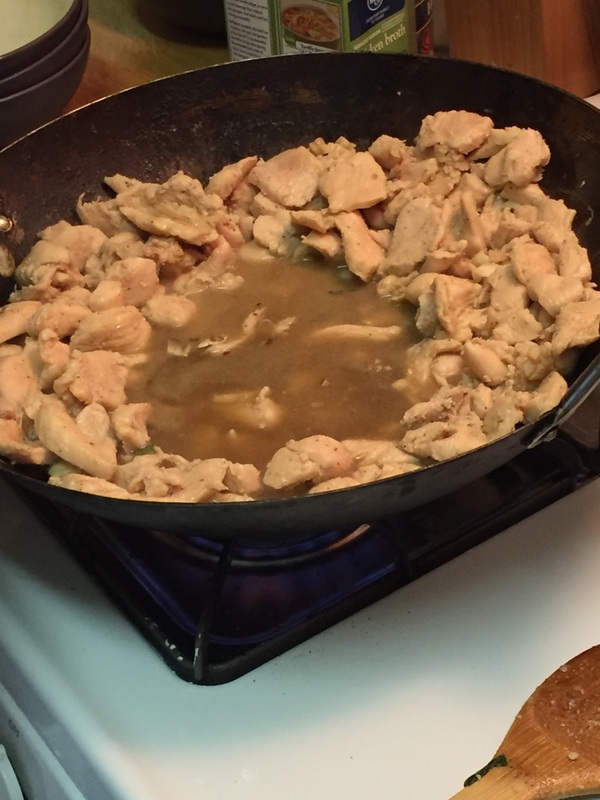 With your super sharp knife, begin by cutting the chicken into the bite-sized pieces and place them into a bowl. (If you are grossed out by raw chicken like me, have someone else cut it for you.) Mince some garlic (those of you battling vampires can feel free to use as much as you like – I’ll stick with a clove or two) and toss on the chicken. Add some soy sauce (depending on the level of sausage fingers you like, add as much or as little as you prefer), some wine (a ¼ c or so), and then stir the whole raw concoction. Set aside. This is not appetizing. I am aware. Just wait. Cut all vegetables into bite-sized pieces and place into a separate bowl. (If you are like Daddy-O, you will have a separate bowl for each vegetable. This makes JiJi happy as she has to wash all the dishes he dirties.) 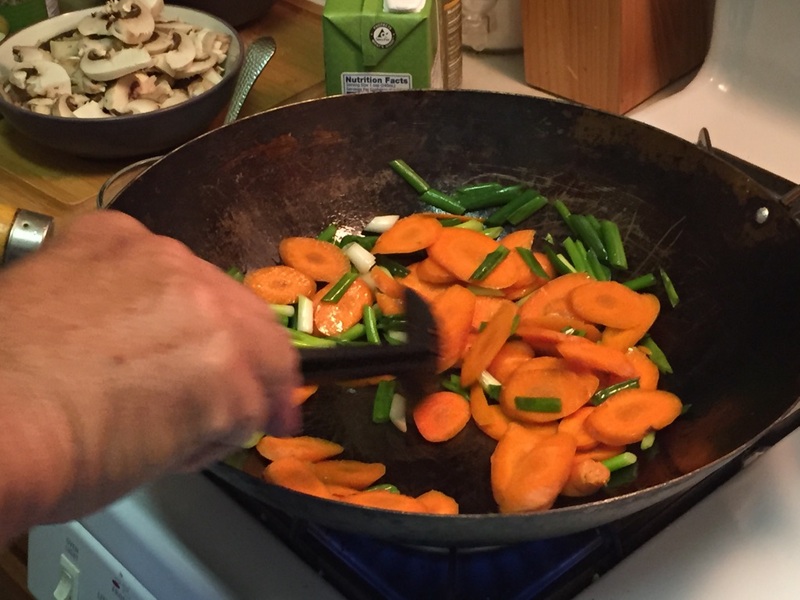 The items that need more cooking time (carrots, onions) should go on top and the easier cooking items on the bottom (water chestnuts, baby corn). Or, in Daddy-O fashion, like the below. Heat a good amount of oil in the wok on medium high heat. Let it get really good and hot and then throw your vegetables in. You can stagger them if you like which is made easier if each vegetable has its own bowl (Daddy-O sounds pretty smart right about now, don’t he?) so that the cooking time is perfect but either way, in they go. 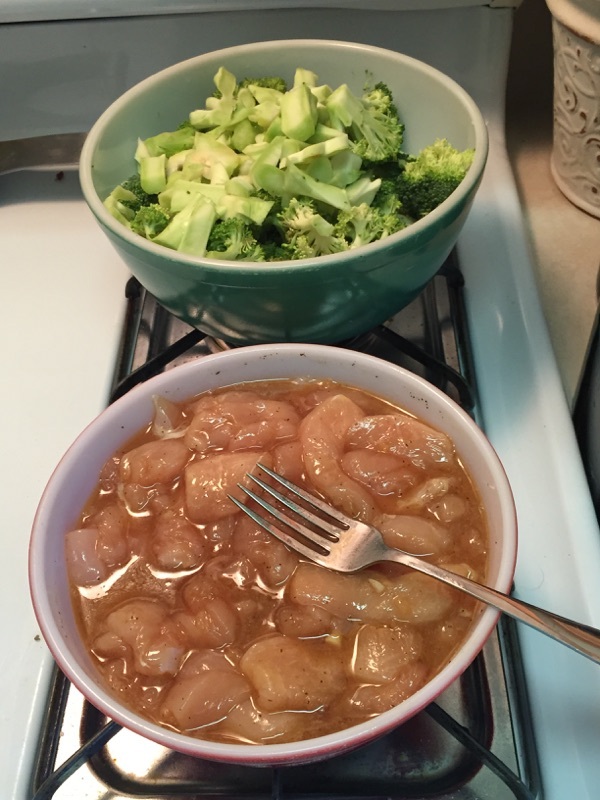 Stir it around while it sizzles and get each vegetable coated in oil. When the heartier vegetables begin to turn bright green and orange, toss in some salt, pepper, and a pinch of sugar. Add some wine and some chicken broth, whatever amounts make you feel good about it, and let all this business cook for a minute or two. Remove the vegetables from the broth and place back in their bowl. Pour the broth into a separate bowl for later use. I love those hands. My Daddy’s hands. Heat more oil in the wok. When it gets good and hot, toss your chicken in and cook until it begins to turn opaque. This is when things start to smell particularly yummy because the garlic is now being cooked. 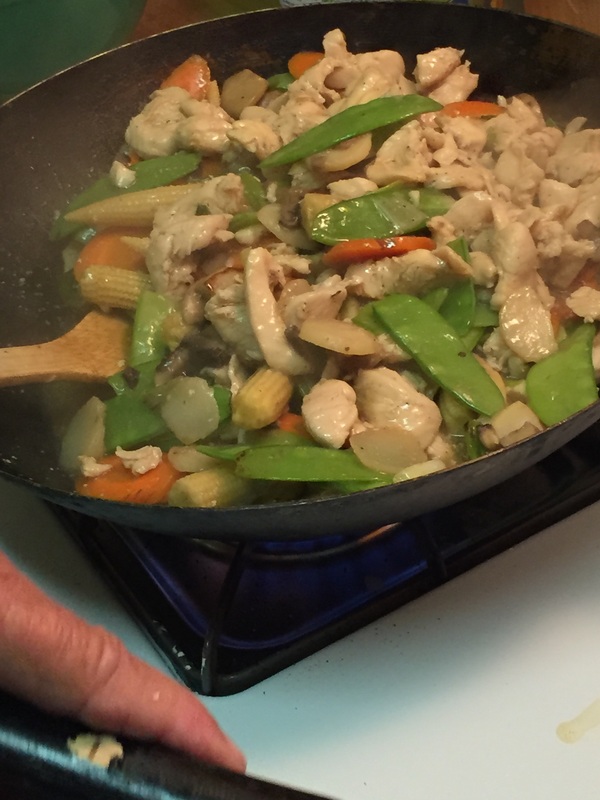 Once the chicken is cooked nearly through, add the broth back into the wok. Stir a tablespoon or two of cornstarch into an additional cup of broth and mix until it sludges. Keep stirring that sludge as you pour into the broth. Smoosh all that around until the sauce begins to thicken and then add the vegetables back in. Stir, cover with your wok lid and set the table. Be quick because you don’t want to overcook your vegetables and make them mushy. Once the table is set, pour yourself a glass of wine and plate up the stir fry over your brown rice. If you really feel fancy you can drive on over to the nearest Chinese take-out place and get yourself an egg roll beforehand but that is not mandatory. Y’all, I took all those pictures to show you how this is done and I totally forgot to take a picture of the final result. This is what happens when you make stir fry for me, though. I get all giddy and flushed of face and leave my phone next to the empty wok. 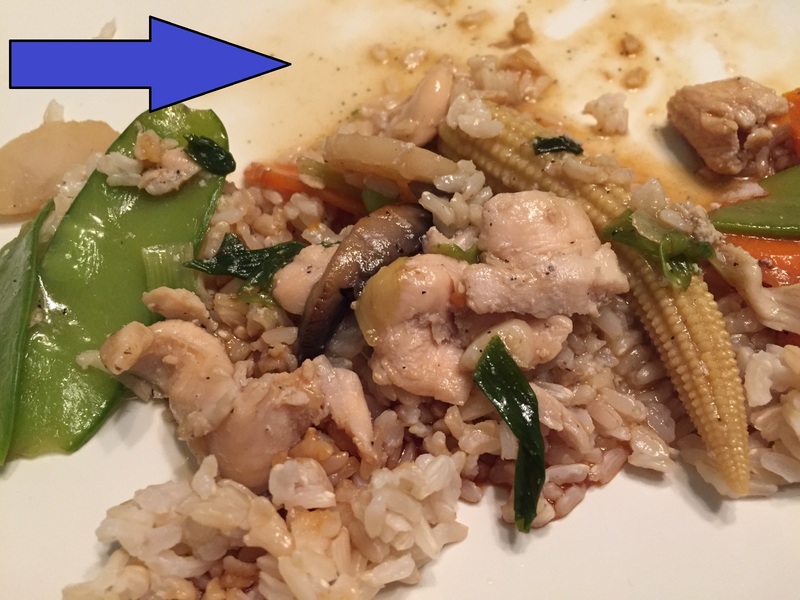 This half-eaten plate is all that was left by the time I retrieved my phone. Still delicious. The love was right there, but I ate it. So that’s it, guys. 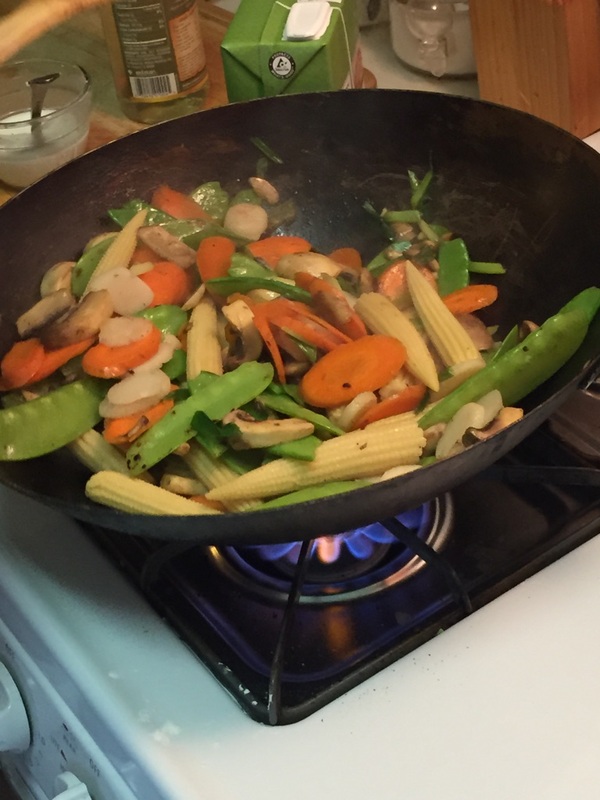 My Daddy-O’s famous stir fry recipe that I love more than chocolate. If you make it, I’ll happily give it a taste test to see how it measures up. I’m a giver like that. 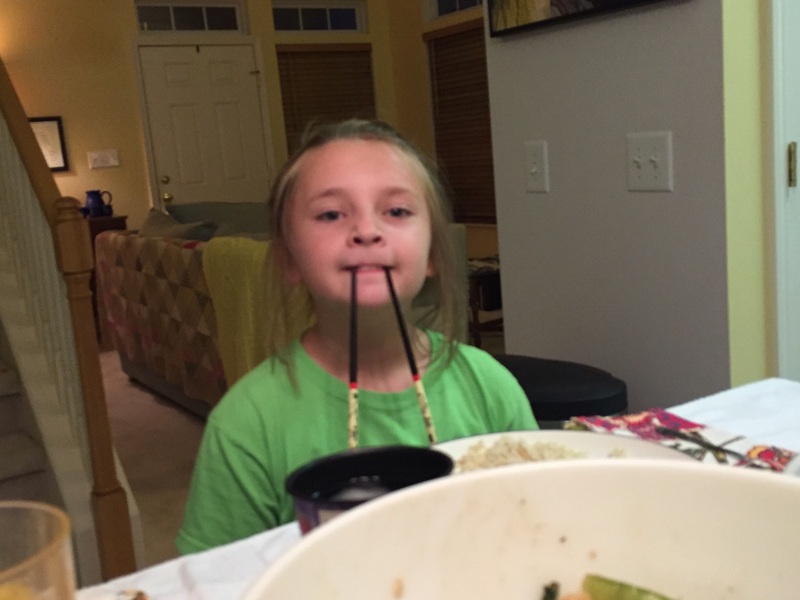 Bonus: This is how Tigger uses chopsticks.